Choosing something flavorful and classic from your arsenal of Father's Day dessert recipes is a fantastic way to cap off a memorable Father's Day dinner and celebrate one of the most important men in your life. Father's Day arrives on the cusp of summer, just when the farmers' market is beginning to come alive and delicious fresh flavors are cropping up in grocery stores. Take advantage of the ingredients available to you and make them the stars of your dishes. All of these recipes are simple at their cores but can be spiced up and altered with different fruits or alternate serving methods. Consider them templates for your own experimentation and enjoy the results! This recipes makes one quart of yogurt. In a large bowl, combine all the ingredients. Stir until the sugar is completely dissolved. Cover the bowl with plastic wrap and refrigerate the mixture for one hour. 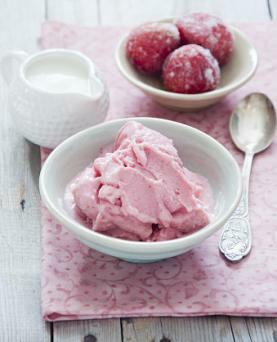 Freeze the yogurt mixture in an ice cream maker, according to the manufacturing instructions. This is a truly tasty Father's Day dessert recipe that's great to make all summer long. The cake serves four to six. In a large bowl, combine the flour with the 2/3 cup sugar, salt, and nutmeg. In a medium bowl, whisk together the buttermilk, lemon zest, lemon juice, melted butter, and egg yolks. Add that mixture to the dry flour mixture, whisking until smooth. With an electric mixer, beat the egg whites until they foam. Add the 1/4 cup sugar, one tablespoon at a time, and continue beating until the whites form stiff peaks. Gently fold the egg whites into the cake batter until they are incorporated. Fold the berries into the cake, reserving a few to place on the top later. Coat an 8" square baking pan with cooking spray and pour the batter into the pan. Place the square pan in a larger pan filled with a 1" depth of water. Bake the cake for 30 to 35 minutes or until it springs back lightly when touched. 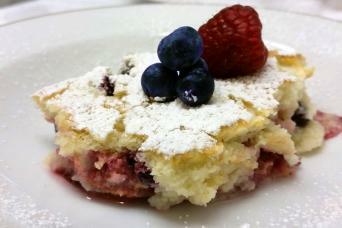 Sprinkle the cake with the remaining berries and powdered sugar before serving. The cake can be served warm or cold. Fresh whipped cream is a treat on its own, served simply with berries or shortcake, or it can be used to garnish lemon pudding cake. This recipe makes enough cream for four main servings or eight servings to accompany other desserts. Before making the cream, chill the bowl of an electric mixer and the beaters in the refrigerator for one hour or the freezer for 15 to 20 minutes. Pour the cream into the mixing bowl. Fit the mixer with the beaters and whip the cream until it thickens. Gradually pour in the sugar in a stream and add the vanilla extract (if using). Continue to beat the cream until it forms soft peaks. 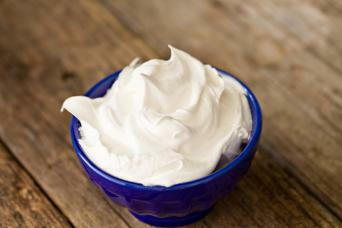 Serve the whipped cream immediately, or store it in an airtight container in the refrigerator until ready to use. For all your dad does for you, doesn't he deserve an especially sweet treat on Father's Day? Try one of the recipes above and give your father a homemade gift he can really enjoy.